Beets are the new “super food.” Beets contain plenty of minerals and nutrients to make us healthier and to help stave off nasty diseases. And, as a big bonus, they can also taste wonderfully. Beets have always been a mainstay of Polish cuisine, and yes, we’ve met plenty of North-Americans who turn up their noses at the thought of eating beets, but many also admitted that they’ve never tried a beet or only tried a sample of pickled beets out of the can -- not so yum! Combine beets, onion and currants. Whisk the oil and vinegar and toss with beet mixture. For a pretty presentation, arrange each scoop of salad on a lettuce leaf. Garnish with finely sliced green onion. Easter is just around the corner and we are looking forward to the traditional feast, with ham, kielbasa, maybe some roast pork, and all the usual sides. 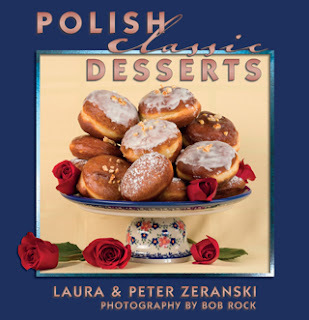 Here is a very classic, truly unique Polish garnish that amazes everyone who tastes it. It takes just a minute to prepare and adds this gorgeous red splash of color next to anything on your plate you’d like to enhance with a little extra kick. And, if you make it a few days ahead of time, the flavors get richer with time as the horseradish infuses more thoroughly with the beets. We always have a jar in the refrigerator since it stores well for a long time. Combine beets, horseradish and sugar. Place in a tightly sealed jar and refrigerate. Note: More horseradish may be added at any time to stimulate a more adventuresome palate. Occasionally Peter gets in a mental zone to kick up the natural flavor of vegetables. He’s probably been watching too many cooking shows on the Food Network. Lately we’ve been playing around with infused olive oils and balsamic vinegars. We are especially enjoying what sesame seed oil does to roasted vegetables and also the fresh kick that comes from drizzling some aged balsamic vinegar over roasted butternut squash. Tonight’s dinner plan is an experiment: broiled filet of rainbow trout with roasted orange beets. One of our favorite dressings for trout filets is made by mixing a few tablespoons of mayonnaise with a bit of Dijon Mustard (the seeds-in variety is best) and some finely sliced green onion. We’ll mix it up well and spread that dressing thinly all over the trout. That goes under the broiler for about 7 or 8 minutes (about four inches below the burner to avoid scorching the mayo yet long enough to cook the fish through. The fish will be done when the mayo mix starts to bubble and just char. So the experiment part of tonight’s dinner will be to roast some orange beets which are a bit milder and sweeter that the traditional red varieties, and just before serving spread some of the mayo mix on top, as a dressing. With the fish and beets on the plate, we’ll sprinkle more of the finely sliced green onion over all of it as another garnish. It should be great! If you try this, or have your own interesting twist on roasted beets, we’d love to hear about it in the comments box below. SMACZNEGO!